Select the Autopilot tab in the Control Panel (the tab has a head as the icon). To read more details on these sections see the appropriate sub chapters of this page. 1. New/Save/Del: Save your own trading strategies here so you can use them in the future. Use the pull down box to find previously saved strategies. Use the New start a new strategy. Use the Save button when you want to save a strategy that you don't want to lose. Use Del. button to delete your strategy. Note: It is strongly encouraged that the trader also keep a hardcopy of their Autopilot settings. 4-5. Trading Quantity & Percentage: Number of units you’d like the trade to place or Percentage of your account you’d like to trade when the trade is placed with max number of contracts to allow. 6. Use Time Restraints (Track 'n Trade Live Only): Start time – When the Autopilot will start looking for buy/sell signals to place trades. 7. Exit Price Bars Before Close (Track 'n Trade Live Only): Choose to exit open orders before the close of the day for that market. 8. 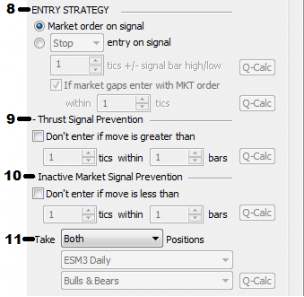 Entry Strategy: Market order on Signal – Click button to place a market entry order immediately on a buy/sell signal or confirming conditional signal. Stop entry on Signal – This option will place a buy stop or sell stop entry order into the market at a predefined number of points (Futures) or pips (Forex) above or below the high or low of the price bar in which the signal arrow is pointing at. Market Gap MKT Order – If selected, you can specify number of points/pips to allow for slippage if the market gaps above the original entry order. (This features was placed in the Autopilot because if the market gaps above where the software was going to place an order the trade would have been deemed invalid and thus rejected by the broker). 10. Inactive Market Prevention: Activate to avoid a sideways moving market. Choose the minimum market price moved over what period of time that you requir to allow a trade. 11. Take Positions / Trend: Choose if you want the Autopilot take Long positions, Short positions, or Both positions. 13. Jump Stops: An alteration of a traditional trailing stop, the Jump Stop will activate only after the market moves a specific number of tics/pips. The stop order will remain solitary until the market moves the amount chosen. You may create a continuous trailing stop by activating the secondary 'Then, if market moves' trigger to continue to moving your stop with each new tic/pip increment. 15. Limit Style. Number of pips for limit profit taking order (points for Futures). Track 'n Trade has two different methods of saving. The primary method is to use the standard "Save" command within Track 'n Trade, which can be accessed by either clicking on the File drop down menu, and selecting Save, or Save As, which gives you the option of saving your complete book for later retrieval; of course, clicking on the floppy disk icon from the button bar will also allow you to save your file to disk. Each file you save will contain all open charts and all settings for those open charts. The first item listed in the Autopilot control panel is the control that allows us to save and retrieve your Autopilot Settings. If you've not saved any system settings, this drop down box will be empty. Very simply, once you’ve selected all of your settings in the Autopilot, you can save those settings by clicking the "New" button. Once you click the New button, you receive a box where you then name your strategy. You can also click the "Default Strategy" button, which will make this strategy the one that opens up as the default for each new open chart. If you make any changes, simply hit the "Save" button and it will save the new changes, and of course, clicking the Delete button will delete the saved profile. After all these user defined filters agree, only then will the Autopilot create a new order to enter the market. The indicator drop down list provides you with a list of available indicators for the active chart. If this box is blank, or does not have the indicator that you want, it’s because you have not yet turned on the indicator from within Track ‘n Trade for the selected chart. By pressing the second radio button, labeled Trade Percentage, you are presented with two fields, asking the percentage of the overall account the trader wants to risk on any individual trade, and the maximum number of contracts that any one trade should ever use. Let’s say you enter 25%, with a 10 Max, the Autopilot will calculate how many contracts or lots you can trade based on a 25% risk factor of your account; Once your quantity calculation exceeds 10 contracts or lots, Track ‘n Trade will limit the number to 10. Loss Recovery is a tool used to try and reduce the amount of money the overall account incurs because of an individual loss. Once a loss has been incurred, the Autopilot Loss Recovery tool will automatically calculate based on the system current settings, how many contracts would need to be traded to recover the loss, and within how many trades. Once the market hits the price point specified by your limit or take profit order, your losses should be recovered. If you don’t have enough money in your account to cover the margin needed to recover your loss, the Autopilot will ignore this setting, and continue trading at the regularly specified quantity. CAUTION: This feature can require a large amount of margin to recover your losses, make sure to test your theory thoroughly with and without the Loss Recovery system invoked, and use care and calculation when using this feature. Trying to recover several losers in a row may cause a significant draw-down of your account, possibly invoking a margin call. Just like an engine has a governor to keep it from revving too fast, the Autopilot has a Thrust Bar Regulator. If the market revs up too high, the Thrust Bar Regulator will keep the Autopilot from entering the market. You’ll often times hear technical analysts refer to this phenomenon as the market having moved too far too fast. By selecting "Trend" from within the drop down menu, you also have the ability to allow the computer to determine a directional bias by adhering to a specific indicator's arrow on another chart of your choosing. Example: If you choose Trend in the first drop down menu, the second and third drop down menu’s become active. In the second drop down window, you see a list of all the active charts. Select which chart you want to use to determine the overall long term trend. Once the chart has been selected, the third drop down window will display each of the indicators available for use on that particular chart. Choose the trend indicator of your choice, and the Track 'n Trade Autopilot will then only trade the trend, based on your selection. One such strategy would be to trade the five minute chart, but to use a 25 and 50 period moving average crossover from the 30 minute chart to determine the trend. When the market is trading above the 30 minutes 25 and 50 period moving averages, we only take long positions on the five minute chart, and when the market is trading below the 30 minute 25 and 50 period time frame, we only take short positions on the five minute chart. For example, with each price advance of the market, Track 'n Trade would also advance the trailing stop, maintaining 10 points, or pips back from the highest, or lowest price level achieved. If the market then falls back within 10 points or pips, to say 8 points or pips, then Track 'n Trade would hold the stop at that level until the market begins to advance once again. Of course, if the market retraces a full 10 points, or pips, then the stop order would be executed and you would be out of the market. When one of these three auto-trailing stop systems are selected, Track 'n Trade will automatically place the stop loss order at either the initial price level specified previously, such as 5 price bars back, or on the first price point of the selected system; whichever is closer to the market. For example, if you specify the initial placement of the stop loss order to be five price bars back, yet five price bars back is actually closer to the market than the initial point of the PSAR, Track 'n Trade will place the stop order five price bars back, then wait to begin trailing the stop loss order until the PSAR stop price point has surpassed the initial five bar back level. This will be the same behavior for all three mathematically calculated stop systems. A limit order is an order designed to take you out of the market once a certain profit level, or target price has been obtained. You can choose to place your limit orders either by points, when trading futures, or by pips, when trading Forex, or by dollars. 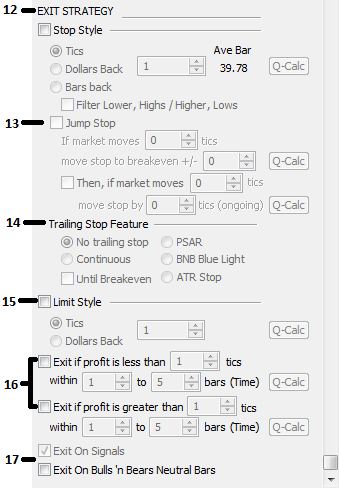 It's important to note, that all stop and limit orders placed from within the Track 'n Trade Autopilot system are done using OCO or One-Cancels-Other-Orders, therefore whenever your stop loss order is hit, Track 'n Trade will automatically cancel your limit order, or if your limit order is hit, Track 'n Trade will automatically cancel your stop loss order. It's also important to note, that when Track 'n Trade automatically places an order, you will see the graphical representation of the order tools, and the actions taken directly on the chart. Of course, you as the "Pilot," or trader can intervene at anytime, and make manual adjustments to your trade by dragging and dropping orders to a different price level, or exiting the position altogether. If you do make manual modifications to the system, this does not disengage the autopilot. Track 'n Trade will continue to monitor the market and make trades based on the rules specified within the Autopilot control panel. If you want Track 'n Trade to stop monitoring the market and to stop trading, you must press the "Stop Trading" button. Exit if profit is less than is used to cut your losers short, and to get Track 'n Trade back to the business of trading. Sometimes, an open trade may stay open for an extremely long period of time, neither reaching up to touch your take profit price, nor reaching down to hit your stop loss order. When this happens, it often seems that the open trade is keeping the system from taking what might otherwise be additional profitable trades. 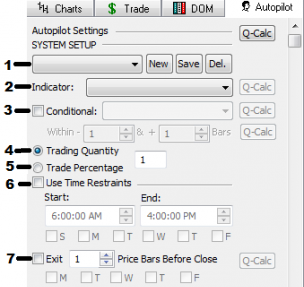 By selecting this feature you can tell the Autopilot to exit the trade if it is not showing promise within a certain number of price bars. Exit on Bulls 'n Bears Neutral Bars [if using Bulls 'n Bears Overlay as the Primary indicator]. Autopilot will exit your position on the next neutral bar of Bulls 'n Bears . Next continue optimizing by clicking each button. The individual Q-Calc buttons are used to optimize profitability for each individual setting. When re-optimizing settings individually the Q-Calc will always arrive at the most profitable setting or it will change nothing. Use specific ranges to narrow your optimizations with the Q-Calc buttons. You may change ranges by right clicking on each Q-Calc button. Note: Saving your progress in intervals is also recommended, in either a book or with the Autopilot save feature. This will insure that you always have an up-to-date saved version of your Autopilot settings. Note: While the Q-Calc buttons are there to speed up the process of finding a winning system you should not rely on the as the absolute best. There are millions of possibilities and one small change in and setting can cause dramatic changes in the overall picture. This is where you find all the performance statistics for the Autopilot system and settings. 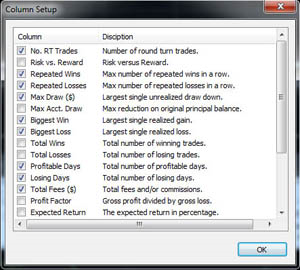 In this row you'll find such things as number of trades and percentage that were winners vs. losers, you'll find repeated wins, losses, and their calculated ratios. You'll find biggest winning trades, biggest losing trades, as well as a number of other statistical results based on your chosen settings. This row of statistics can be modified by right-clicking on the header and selecting "Column Setup" from within the right click menu. This action will open a window that is full of different analytical results, choose just your favorites, or choose them all. To select and display the equity graph, press the Autopilot Graph button. The graph is a visual representation of historical price performance based on the accuracy of your system settings. By right clicking on the chart, you receive a right click menu where you can make visual adjustments to the chart. You can select whether you would like to see the graph displayed as a histogram, or as a line chart, and if the line chart should be filled. You can also choose to have the graphs performance values exclude or include the initial balance stated above. individual trade as they would historically have been executed from the current settings within the Autopilot. In this list, you'll see each trade, if it was a buy or sell, the entry and exit times, the profit and loss, fees and balances.You'll notice that we have a column labeled "Daily Realized" in this column, you'll also notice that each day is highlighted with an alternating background color; the calculated "Daily Realized Balance" is for that particular trading day. By double clicking on any single trade listed in the table, Track 'n Trade will automatically center that trade on the screen, and highlight the buy or sell signal that generated that trade. This is helpful in analyzing individual trades, to see what adjustments might be made to the system, to help the statistical performance. Pressing the Print button pulls up a visual report of all the settings that were used in the creation of this particular Expert Advisor, or trading strategy. Notice at the top, you have listed all the Autopilot settings, the stats for this trading strategy, the equity chart, and each individual trade for the timeframe specified that created this equity graph, and return on our investment.